Josh Kidder of Archbold (14) handles a ball in a district semifinal game this season. 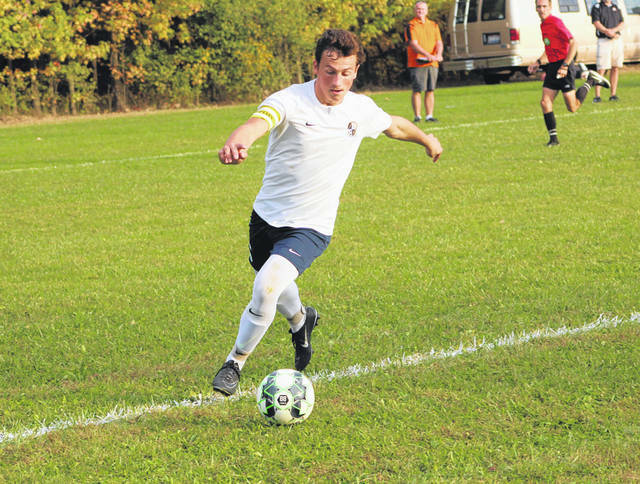 He was selected the state’s player of the year in Division III. 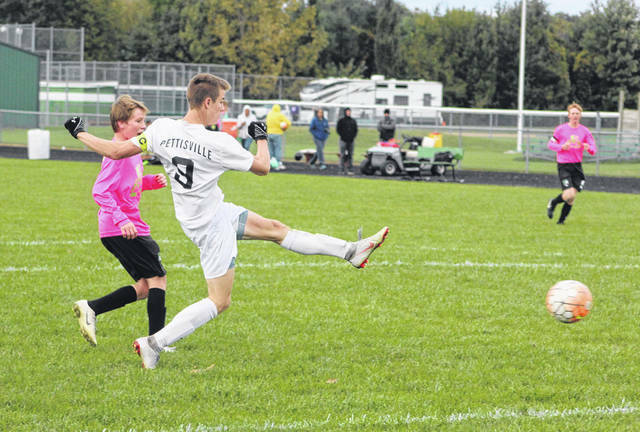 Detric Yoder of Pettisville scores a goal versus Delta this season. Yoder was second team All-Ohio for the Blackbirds. Andrew Hogrefe of Archbold with the ball in a regular season contest at Liberty Center. He received second team All-Ohio honors for the Blue Streaks. 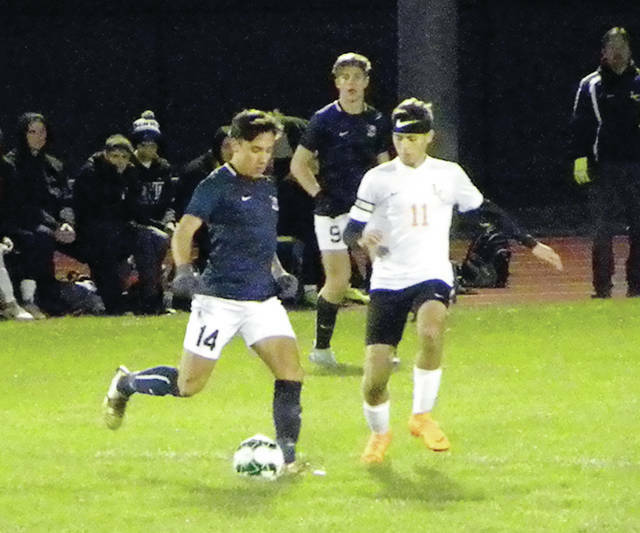 The All-State boys soccer awards were announced recently by the Ohio Scholastic Soccer Coaches Association. Locally, three players received honors in Division III. Josh Kidder of Archbold was the player of the year. Also for the Blue Streaks, Andrew Hogrefe made second team All-Ohio. Second team All-Ohio for Pettisville was Detric Yoder. Mujahid Abdel-Ghani, sr., Maumee Valley Country Day; Victor Aguilera, sr., Rock Hill; Noah Alexander, sr., Dayton Christian; Sam Belitz, sr., Independence; Shiloah Blevins, sr., South Webster; Marcus Browning, jr., Bishop Rosecrans; Brennan Callow, sr., Seven Hills; Manny Day, sr., Grandview Heights; Eli Dulle, jr., The Wellington School; Kevin Hileman, sr., Ottawa Hills; Declan Howell, sr., Hiland; Jalen Hudgins, jr., Troy Christian; Josh Kidder, sr., Archbold; Keagan Leroux, sr., Western Reserve Academy; Jeremy Lunka, sr., Kirtland; TJ Manning, sr., Reading; Jared Mount, sr., Mansfield Christian; Dylan Schreder, sr., Ottawa Hills. Player of the Year: Josh Kidder, Archbold. Coach of the Year: Nate Baer, Ottawa Hills. Tom Biegel, jr., Catholic Central; Anthony Buechly, sr., Cincinnati Country Day; Josh Cook, jr., Johnstown-Monroe; Cain Duskey, sr., Orrville; Josh Erlandson, sr., Dayton Christian; Matthew Falkenberg, sr., Triway; Sam Freeman, sr., Grandview Heights; TJ Gaydosh, sr., Mineral Ridge; Trent Green, soph., Greenon; Andrew Hogrefe, sr., Archbold; Aaron Jolly, soph., Wheelersburg; John Kight, jr., Ottawa Hills; Ryan Lienhart, sr., Madeira; Damon Luchette, sr., Badger; Jamon McCort, jr., Sand Valley; Cody Meyer, sr., Botkins; Fernando Onate, soph., Caldwell; Nathan Peppers, sr., Tree of Life; Henry Pedromo-Mejia, sr., Campbell; Henry Perkins, soph., Central Christian; Joacib Pribe, sr., Madison; Jacob Ruth, sr. South Webster; Spencer Shroge, sr., Beachwood; Hunter Stone, jr., Van Buren; Parker Strauss, sr., Liberty Center; Julian Surckla, sr., Newbury; Evan Throckmorton, sr., Northwest; Cole Wagner, jr., North Adams; Brian Wells, sr., Columbia; Jacob Wickline, sr., Crestview; Ian Wolfe, jr., West Liberty-Salem; Jacob Wynne, sr., Troy Christian; Detric Yoder, sr., Pettisville; Luke Young, sr., Bluffton; Chris Young, sr., Lynchburg-Clay; Christian Zavarelli, sr., Lake Center Christian.